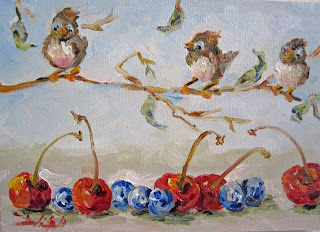 I wanted to paint a row of cherries because I had bought a whole bag of them and I thought if I lined them up making the little stems go every which way it would make an interesting painting, I had them all in a row with the lighting just so...them my mind took of and I thought what if I added a few blue berries. I did a quick sketch imaging the blue berries because I had none. Sometimes it's great to be an artist the world is at the tip of your brush. Then I went crazy and put those chubby little bird on a branch just checking everything out. 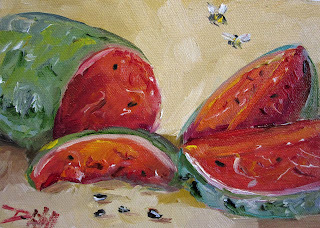 With the first day of summer behind us it is time for those summer barbeque's and picnics.I don't know about you but I always like watermelon at my outdoor fun.If you have a nice red juice watermelon with lots of seeds you can always have a seed spitting contest. So boo haa on those seedless kinds, they are not as tasty anyway. 5x7 oil painting on a museum quality panel ready to frame. 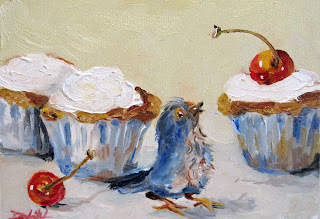 What would the Fourth of July be with out cup cakes cherries and a few Party guests? posted by Carol Marine ,This is a simple challenge - wrap a gift and paint it. You can use any kind of paper, bows, and fanciness you want. You can accompany your gift with other things or it can ride solo. About This Painting: Old rusty trucks and farm equipment always pull at my heart stings call to me to paint them. 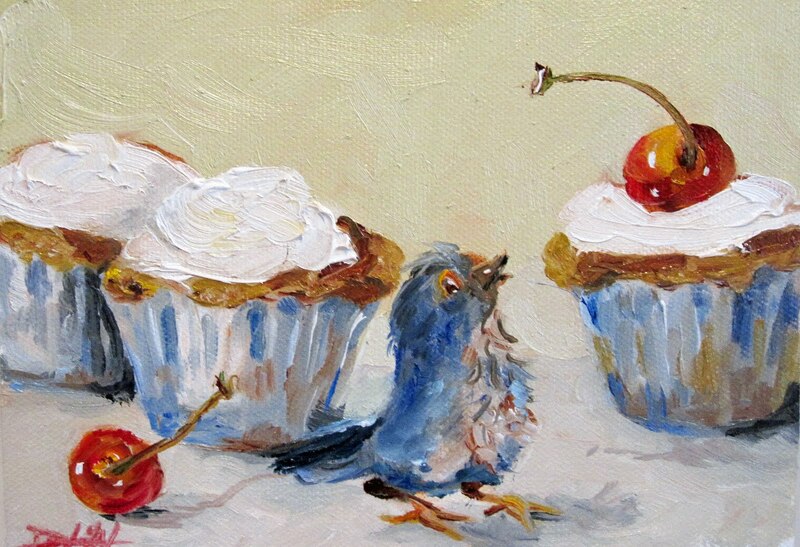 About This Painting: Dragonflies and bees keep showing up in my paintings, so I now have a series on them,I think these little guys are driving me buggy. 5x7 oil painting on canvas ready to be framed. Tomorrow on my Art on Paper blog I am going to help a friend stay motivated and also help out one of my favorite Charities, Hospice. I will be posting a 9x12 watercolor each day for $47.00, free shipping in the US and will donate $4.70 to Hospice. To find out more about this challenge or just to join in and help a local charity of your choice visit my blog tomorrow and read more. Human beings are the only creatures who can imagine themselves becoming something new and different than they are. We can imagine ourselves becoming stronger, learning new skills or living differently than we currently do. Take advantage of this! Imagine yourself in new ways! Then develop a plan, take action and make it happen. You are in charge of your future. About This Painting: Summer days for me are always about being in the country and walking through the fields,smelling fresh cut hay on a summers night, and dipping my toes into a lake or stream. Enjoy your summer. 7x5 oil on canvas ready to frame. I don't live where there are mountains but I travel and take lots of photo reference's to paint with later. 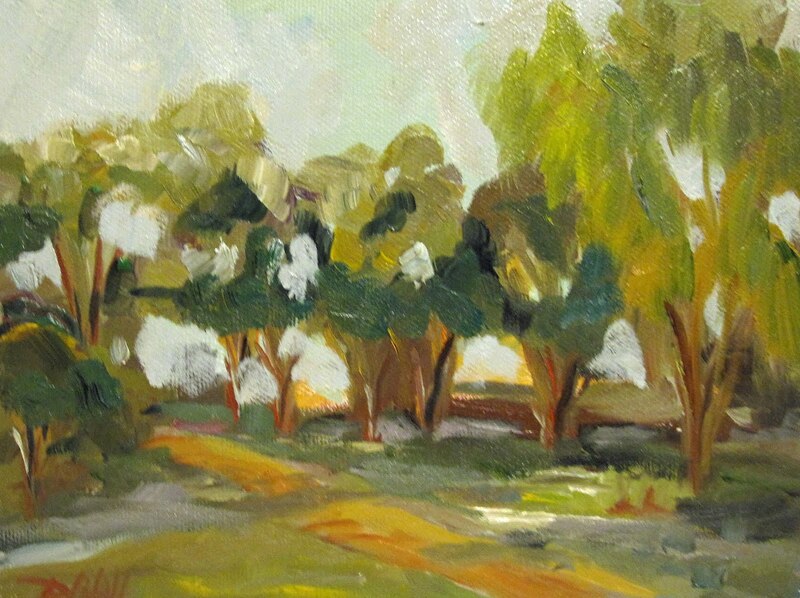 One tip I will over to you if you like to paint landscapes is to break it down into 4 or 5 basic shapes. This sound easier than it is because there is so much to look at. I always carry a sketch book and practice drawing shapes in it. About This Painting: Colorful sail boats bob in the waves turning the reflections into a sea of color. About This Painting: In English the noun became a verb, to birch. Birching was the now-discredited practice of flogging British schoolchildren with birch twigs tied into a nasty, welt-raising bundle. Pious pedagogues even had a sad little saying to accompany their sadomasochistic act: “I must send you to Birchin Lane .” The cheap pun recalled an actual London street. Even in Shake-speare’s time Birchin Lane was well known for second-hand clothing stores, being lined with apparel emporia where an impecunious Elizabethan swain might pick up a bargain in a maroon velvet doublet. About This Painting:Michigan sand dunes are a resource of global significance; they are the largest assemblage of fresh water dunes in the world. There are about 250,000 acres of sand dunes in Michigan of which about 70,000 acres are classified as critical sand dune formations. The Michigan Legislature has found that the critical dune areas of this state "are a unique, irreplaceable, and fragile resource that provide significant recreational, economic, scientific, geological, scenic, botanical, educational, agricultural, and ecological benefits to the people of this state and to people from other states and countries who visit this resource". I am not the only artist who enjoys a day at the dunes. 5x7 oil paining on canvas mounted on a museum quality panel ready to be framed. 7x5 oil on canvas mounted on a museum Quality panel ready to be framed. I have had several request for tooth fairies and I have been so backed up I just hadn't gotten to them so I'll will try to paint a few in the next few weeks.Fantasy is always a fun change for me.I saw Pirates of the Caribbean 4 On Stranger Tides last night so now I have mermaids. Johnny Depp was his always swashbuckling silver tooth charming self and you have to love the hair. I am already waiting for number 5. But before I paint pirates and mermaids I must paint a few more tooth fairies. 5x7 oil on canvas mounted on a museum quality panel ready to be framed or sit it on a small table top easel. About This Painting: I wanted to show the size of the barn in this painting so I painted the tractor small to draw your eye upward to the barn. About This Painting: I am sure you will be seeing a few more of these Bee's in my painting, so they will bee back. Here is a video of the Paintings I that I did in May. I had so much to do today I needed to be ten people. Do you ever feel like that? I have been working on the large 30x40 Cows in Green Pasture painting. Part of me says it's done but another part feels like it still needs a little more brush work. I am going to set it aside for a few days a take another look at it with a fresh pair of eyes. About This Painting: Now back to my daily painting. This is a painting of the Lower Chasm Falls . These falls are in Colorado if you would like to see some pictures of them click here. I painted parts of this with a palette knife and I will be doing another larger painting maybe about 9x12. About This Painting: I have been working on a large pasture painting. It is a 30x40 with lots od shades of green in it. I have been work on small daily paintings of cows to get a feel for the way I want the large painting to look. I think I have put the final touchs on it today. I may go back and work on it again at a later date but I think I have resolved the issues that were bothering me. I will post it tomorrow so you can be the first to see the new painting. Todays post is a small study of pasture cows. About This Painting: I paint a few chicken pictures every month. I visited my uncle and his chickens on the farm near Colon Michigan a few days ago. If you have never been to Colon it is a very small town in Michigan with a lot of history to it.They have title themselves Magic Capital of the World. Every year in magicians come from all over the world to learn new tricks of the trade at Magic School. Then they put on a show. Harry Blackstone is one of the more famous Magician to have lived and performed in there. There are few very famous current day Las Vegas performers who got there start in small Colon Michigan but deny every being there but Colon has the records. Try to quess who they are. Maybe they are just chicken to tell us. About This Painting:My cherry tree just bloomed so I am hoping to get cherries this year. Last year the birds got them first. I went a little expressionist here, I had fun with brush work and color on this little pile of peppers.To view some of my larger paintings stop in at my web site Delilah Smith.